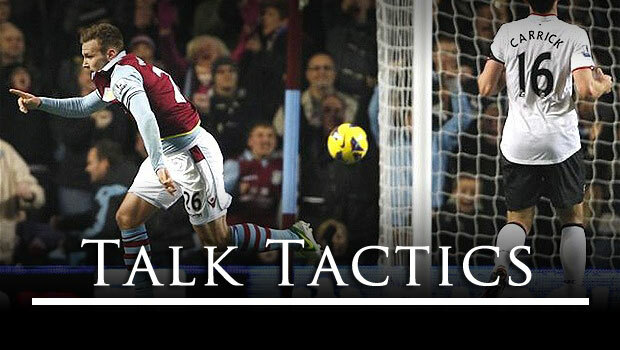 Talk Tactics – Are Aston Villa’s Problems Physically Or Mentally Based? AVFC | Aston Villa Life - An Aston Villa Blog and Mobile Site for iOS and Android > Aston Villa Blog > Columns > Talk Tactics > Talk Tactics – Are Aston Villa’s Problems Physically Or Mentally Based? It was a solid performance, yet Aston Villa lost. We played well, but took no points. However a fan chooses to frame the game, it was far from straight forward. It isn’t that often that general positivity can be high when a team takes a two goal lead and turns it into a loss, throwing away a chance to end a 17 year hoodoo but that seems to be the response following the 3-2 defeat against Manchester United. I’ll be honest with you now and say that I’m afraid picking apart the performance tactically will lead only to a long-winded way of trying to explain something that could be described in a few words – Villa’s team lacks structure under pressure. This “revelation” is far from anything new, but it is exactly how the team is now, as well as how the team has been for some time, whether the manager was Paul Lambert, Alex McLeish, or even Martin O’Neill. Tactically, the manager had things exactly right in how he set the team up, designed as they were to work hard, press the opposition, and otherwise take the game to the league leaders. Make no doubt about it, there was a massive difference in outlook between the mentality of the Scottish Villa manager this season compared to another Scottish Villa manager last season. Last season, McLeish’s Villa tried to stem the flow against United, ceding the game in a structured, if somewhat pointless, effort. One could argue that the result last night was technically the same – zero points gained – but doing so would be doing Lambert’s attacking mentality a disservice. Lambert’s team played very well for the first half, though this is statistically unsurprising as the Birmingham club are easily in the top six clubs for first half performances – where Villa come undone is in the second half. There’s a number of reasons a person can put forward as to why Villa fade in the second half, be it fitness levels, concentration, or simply lacking the ability to close out a game. However, Villa’s issues aren’t likely a physical issue, rather a massive psychological one. Can any of us argue about that statement? 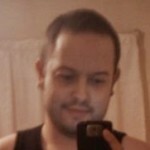 More to the point, did any of us think anything different when the first United goal was scored by Javier Hernandez? I imagine plenty of fans would have put money on Villa losing 3-2 once United got their foothold back in the game. However, this is Talk Tactics after all, so we need to dig deeper into the reasons for Villa’s capitulation, even though 90%+ of it is simply explained by the club’s jittery psychology. Good effort, but what happened? As the game unravelled, should we put blame on our defence for their inability to keep out the United attacks, or simply say that our Manchester rivals were merely directed brilliantly by one of the world’s best managers of his generation? Many fans cheered as former player Ashley Young was withdrawn at half time, clearly feeling that the former Villan’s removal was the clearest example of how Villa’s former number seven was unable to play against a resolute Villa rearguard action. However his replacement, the brilliant poacher Chicharito, was to be the undoing of a team performance that was 1-0 up at half time, and soon to go 2-0 up as Villa Park erupted into scenes that I haven’t seen since O’Neill left the club. To begin, let’s look at why Ashley Young didn’t manage to breach the Villa defence, and what led Sir Alex Ferguson to withdraw United’s number 18. Looking solely at Young’s pass completions rate, many would struggle to see the reason why United’s manager withdrew him at half time, but clearly Ferguson did so for tactical reasoning. The reason Young did make way was because his passes were not penetrating the right areas, regularly being beaten away by a well organised defence – a prime criticism of Villa’s performances this season in terms of being solid in possession, but lacking in end product. I don’t think I’m being over-the-top when I say that Valencia’s performance was of the highest quality on Saturday night – the former Wigan man was simply brilliant, regularly outpacing everyone and anyone that tried to stop him. Compared to Young, Valencia tried six times as many take-ons, and attempted six times as many crosses, proving fairly succinctly why Sir Alex took off Young and not the Ecuadorian. Enough of United, what about Aston Villa? Benteke was the number one and number two recipient for balls from another Villa player with passes from Brad Guzan and Barry Bannan being the most made passes by the home team. 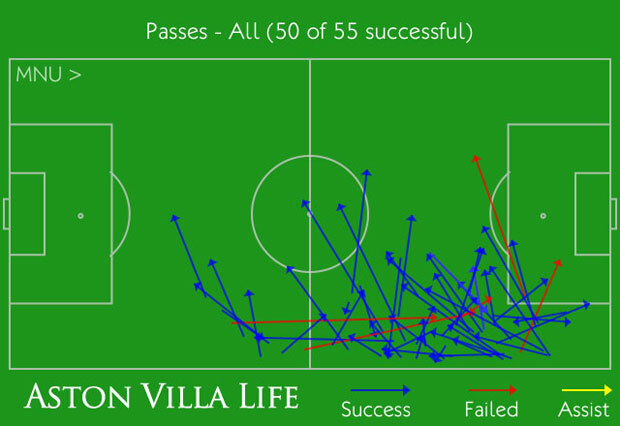 The third combination of passes from Villa was Bannan to Gabriel Agbonlahor, further cementing Bannan’s performances after a good result against Sunderland. Away from Benteke alone, the statistics tell a varied story that has to be looked at as a whole. 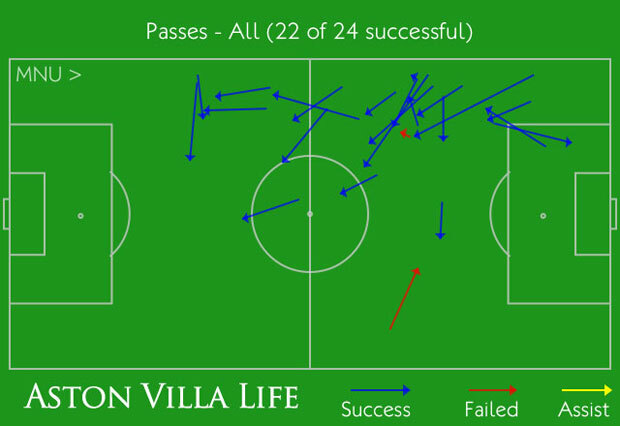 Villa attempted 283 passes, completing 218 giving a fairly respectable 77% pass completion rate. By comparison, United attempted 672 passes, completing 598 giving a great 89% completion. Possession wise, Villa were also behind with only 30.5% compared to United’s 69.5%. However, as I’ve said many times before, possession alone is not a true indicator of performance, and Villa managed a far more respectable 44.9% of territory compared to United’s 55.1%. Looking at both of those figures, and then putting them into context, we can make some fairly solid suppositions. Firstly, that United’s passing, whilst higher in number and completion, was not always effective. Having the ball is not synonymous with doing something, and combining passing figures with the territory shows that many of United’s balls were simply focused on maintaining possession. Villa were behind on crosses attempted & completed, with Villa completing five of 23, and United managing 11 of 42. This is largely to be expected when we consider that Villa play narrow, and do not generally have the players to put balls in the middle in a traditional winger sense. 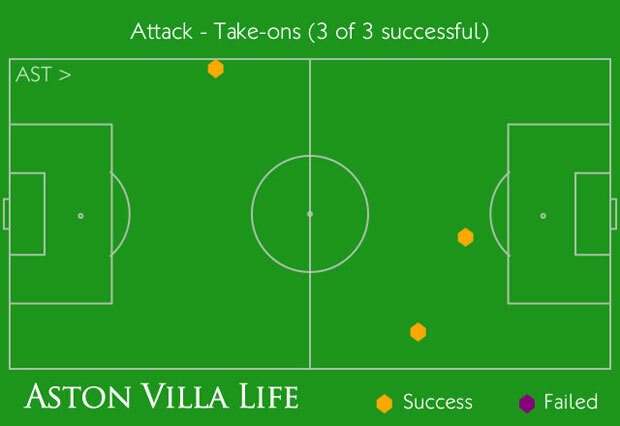 On take-ons, things were roughly equal with both teams attempting 12, though Villa completed only three compared to United’s five. It’s also worth noting that Benteke was the only Villa player who completed a take-on, managing a 100% completion record. Finally, what does this mean? A dominating central midfielder – whilst the team have done well as is, a solid central midfielder would be an ideal addition to mix things up a bit and to give the team a bit of height. I know our focus is solidly on passing, but it doesn’t hurt to have a player who can boss the midfield physically too. For me, a player like Mohamed Kalilou Traoré would be useful because of his height and frame, though not necessarily that particular player. A central defender – I think most of us would like to see a player who can link with Ron Vlaar. Whether Ciaran Clark is the answer long term, many are uncertain and a big, athletic centre half could well be imposing and effective for the club. Someone as big as Christopher Samba would be ideal purchase, but even a player such as Mahamadou Bamba N’Diaye could be effective and relatively cheap. If not, a player such as Mohamed Awal would also be worth a gamble. However, Villa may well want to go for a more established player. So that ends Talk Tactics for this week. Now, it’s over to you. This entry was published on November 12, 2012 / Matt Turvey. Posted in Aston Villa Blog, Columns, Talk Tactics, Turvey's Thoughts. Bookmark the permalink. Lambert Out? The Stupidity, It Burns Us. What is causing Aston Villa to choke when they concede a goal? Is it physical or mental? Can Lambert Prove Alan Hansen's Analysis Wrong? Ben Sparey asks if the kids are the future at Aston Villa, and how they can make an impact on the team.